Between 14 and 15 of September 2017, Bucharest hosted the FIG Commission 7, 8 and 9 International Symposium GeopreVi 2017, having as a theme 'Smart Solutions for a Secure and Valuable Property'. More than 200 professionals (surveyors, land administration, spatial planning and development and land valuation professionals), from more than 10 countries, met in Bucharest to debate and communicate in a professional and scientific manner, exchanging knowledge and experience in finding out smart technical solutions in order to ensure a more secure and valuable property in the modern and challenging forming society. 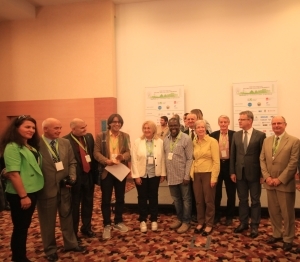 In Bucharest three of the FIG commissions were working together: Commission 7 was represented by Chair Mrs. Gerda Schennach from Austria, Commission 8 was represented by Chair Mr, Kwame Tenadu, from Ghana and Commission 9 was represented by Manohar Velpuri, WG chair, . 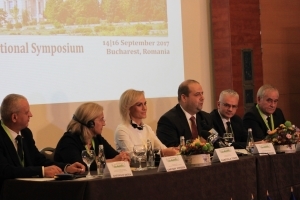 “It was a great initiative to have those three commissions in Bucharest, as all three commission understand what good land management is”, President Potsiou mentioned. Two outstanding FIG members, the Honorary President Mr. Robert W. Foster from USA and honorable member Daniel Steudler from Switzerland were invited in Bucharest, rising up the interest of the audience with themes such as the universal set of ethics principle and Land Code.